LOCATION: This home is just a few steps from the beach access. DETAILS: Nantucket meets Florida in this third-floor condominium with accommodations for six in Compass Point. Knotty pine floors and nautical blue slipcovers and accents define this classic seaside cottage with open living area bathed in natural light. The living room is furnished with a sleeper sofa, tons of seating, and a TV with Bose stereo surround sound. 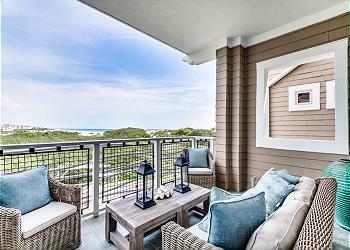 A glass door opens to the balcony where guests enjoy the breeze and views of the gulf. The kitchen is equipped with granite countertops and stainless appliances. Grab a quick snack at the breakfast bar which seats three, or enjoy a bottle of wine with friends at the dining table for six. The master bedroom is furnished with a king bed, TV and access to the furnished balcony. The master bath has a generous soaking tub, separate shower and double vanities. The second bedroom has a king bed, TV, and shares its bathroom with the living room. 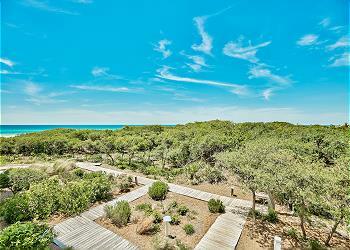 Compass Point is composed of two multistory condominiums located in the western side of WaterSound Beach. The dunes in front of Compass Point I and Compass Point II are teeming with protected sea oats, wildlife, and other naturally occurring vegetation. Stroll down the board walk to the beach, Dunsider Pool or Compass Point II pool. WaterSound Beach Club is to the left of Compass Point and can be accessed by boardwalk or vehicle. AMENITIES INCLUDE: Community Pool, Gulf Views, Gourmet Kitchen. Parking can be found throughout the community. Complete Clean Linen Participant - ALL linens, including comforters laundered upon every checkout. We are so glad that you enjoyed your stay with us in Watersound and for choosing 360 Blue for your vacation rental needs. We hope to host you and your group again very soon! It was great!! Such a sweet time with the fam in a perfect location and perfect condo!! We are so glad that you enjoyed your vacation! We agree that these condos are perfect and the photo you shared is breathtaking! We look forward to seeing you and your family again soon! What an amazing vacation! My husband and I love taking a break from the cold and bringing our two young boys down to the beach this time of year. This was our first time staying at Watersound and I don’t think we will stay anywhere else on 30A ever again! We took long walks around the property and rode bikes to Rosemary and Seaside. It’s the perfect location. The unit was equally amazing. It had everything you would ever need in the kitchen and all the pots and utensils were in good condition which is hard to find in a rental. You can tell the cleaning service really pays attention to details when readying for the next guest. The one and only concern was that there was no allotted “pantry” space. We ended up just putting our food items in a basket but if we were there longer it would have been inconvenient. 360 Blue did an incredible job from the second we made the reservation to the second we left. They even sent someone immediately to fix a bike issue while we were out exploring. We def will come back! We are so thrilled that you had such an amazing stay at this beautiful home. It is truly the perfect place for a relaxing beach getaway for families of all sizes. We loved having you with us and hope to see you back soon! My adult daughter and I had not seen each other in about a year and a half. We had a wonderful time at Christmas in Watercolor, and specifically in this property, simply relaxing, reading, watching movies and enjoying the beautiful gulf views right from the porch and the living room. We experienced mild (for me) weather. The temperatures were in the high 50s to mid-60s in Watercolor, but in the teens back home. This is an extremely nice residence. It is very well built. Solid. Quiet. Beautifully decorated. It is totally inviting and very comfortable. Very high quality. The property completely exceeded my expectations. In fact, it blew me away in the best possible manner. If I could contact the owners personally, I would thank them for making such a beautiful home available for other people to enjoy. It was a privilege to have been able to experience this home. Thank you to the owners and to 360 Blue for making our stay such a beautiful and memorable experience. 360 Blue made the processes easy. What an amazing time, to be reunited with your daughter at Christmas! We are so glad that we could be a part of this awesome memory. It is easy to relax inside or outside the condo, with the wonderful views of the Gulf provided from the living room and the balcony. The weather has been beautiful! We are thrilled that you found this quiet condo so inviting and comfortable. The beautiful décor does add to the high quality feel. Exceeding expectations is our goal, so we love to hear that you were blown away! The owner will be pleased to hear this awesome feedback from you, so we will be sure to pass it along. It is our pleasure to make your stay such a memorable experience. 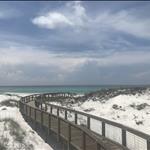 Vacation planning is supposed to be easy and fun, so please be sure to contact us next time you decide to visit 30A! We look forward to having you again as our guest!